Berry Springs Lakes Holiday Park is set on 900 acres, a green and tranquil peaceful property, providing affordable accommodation close to Darwin, in green and tranquil surroundings. As a 3.5 star Tourist Park, we have all the facilities you'd expect, plus a few extras. Our comfortable air-conditioned cabins sleep 4-6 people and come fully equipped with linen, ceiling or wall fan, television, microwave, cooking facilities and utensils. Ensuite cabins feature all of the above plus ensuite. Excellent weekly rates. 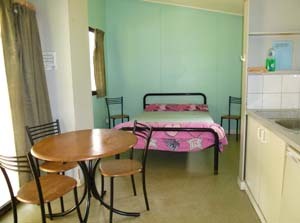 The Lake Cabin overlooking scenic Lake Barden, is air conditioned with ensuite. Our beautifully maintained grounds with grassed / concrete drive through powered sites are perfect for your caravans and motor homes. There are abundant grassed shady camping areas. 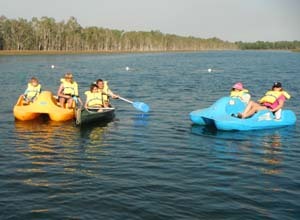 Enjoy the natural spa, canoes and paddle boats.